This Caliendo hopsack blazer was completed earlier in the year and is now fast becoming the most useful item in my wardrobe. I’d recommend this type of blazer for anyone – bespoke or ready-to-wear – as a staple of a modern wardrobe that needs to look smart, but rarely makes use of a suit. I have worn the jacket regularly for the past two months and – although it has been conscientiously hung and brushed – it has not been pressed. It has done well under those conditions: a few wrinkles here and there, but fewer than most other lightweights. 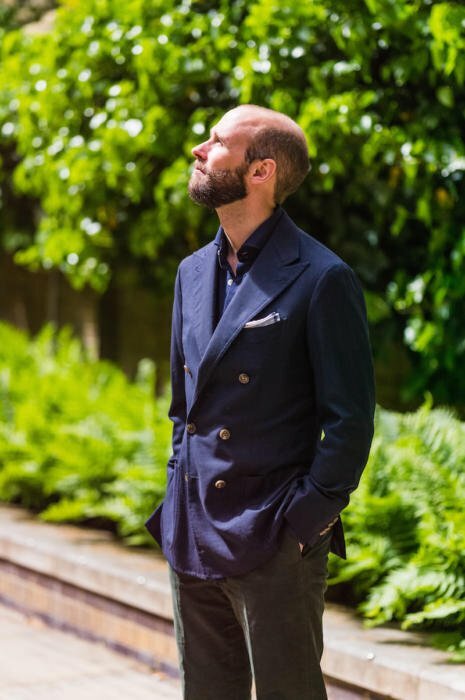 Elia Caliendo is probably my favourite Neapolitan tailor – he has previously made me a tan summer jacket, my Permanent Style tweed, and my Harris tweed. Together with the Solito cashmere, it’s a nice little capsule wardrobe of jackets. Elia has done a good job here, with fine finishing on the seams, lining and swelled edges. The buttonholes aren’t as delicate as any other tailor outside Naples, but they’re good for a Neapolitan. The only area Elia sometimes has issues is the vents, which can be cut a little short and without enough overlap, allowing them to open completely at the bottom. This is an issue here as well, and one we’ll correct later in the year. I do like his tendency towards narrow, straight lapels on DBs however. Brown horn buttons, Simonnot-Godard handkerchief and my green cotton trousers from Calvo de Mora. The hopsack is a Loro Piana jacketing, 230g. The polo shirt is from Luca Avitabile – a collaboration that we’ll have more news on soon. You can follow the discussion on Hopsack blazer: the perfect summer jacket by entering your email address in the box below. You will then receive an email every time a new comment is added. These will also contain a link to a page where you can stop the alerts, and remove all of your related data from the site. Simon. Nice jacket. Nice idea. But look at those lapels. They look very puckered. That can’t be just the photo. Why have that stitching ??? As ever it is partly the photography. The chest is smoother than that too. But you do get some puckering on hopsack with hand sewing like those swelled edges. Personally I like it as an effect, but I know what you mean – it certainly makes the whole thing look less smooth and formal. Love the material and colour but the pocket square is lifting the lapel due to the very close proximity. Is the lapel a smidgeon too wide or is that just Neapolitan design? My favourite item you have had made, so far. Perhaps darker buttons would be more versatile, but still. My favourite outfit includes a DB in navy like that (Dover model from Boglioli), well worn indigo jeans (to make contrast) and tan wholecuts. Depending on the situation I wear either a sunspel t-shirt or a shirt. You mention you’d recommend a blazer like this in RTW . Would you care to mention any names / brands ? I wish you’d made this post about 4 months ago. I’ve just taken delivery of a navy single breasted hopsack blazer with patch pockets and similar buttons etc. I did feel a little concerned about the fabric after it had been recommended by the tailor that it was a little too smooth/ too much sheen and unfortunately its somewhat true. Wish i’d stuck to my guns and looked at other fabrics as this looks a bit more casual which is what I was trying to achieve. Sounds nice Jack, even if it is a bit more formal than you wanted. As polo shirts were mentioned (I presume this refers to the long sleeved versions), it would be appreciated with recommendations not only on bespoke but also RTW items. Excellent idea with a long sleeved polo shirt underneath a casual jacket, but it seems hard to come by with collars good enough for the purpose. May I inquire when (and perhaps where, if not on your blog) the RTW polo shirts will be offered? They seem like a very good idea at the present moment. They should be available on Monday! Apparently the swing tickets are late…. Now launching July 10th. The shirts are all made already though, so you can get them immediately. Great. And the will be ordered through you or through LA? I spent a fair while looking for long sleeve polos with good collars. In the end I setttled on Kent Wang: they have worn well and a reasonable price so worth the hassle of shipping over from the US to England. They also do a MTM service of sorts (minimum 3 shirt order) although I haven’t tried this out. The Armoury also do nice polos but a step up in price. Excellent jacket Simon. Is it completely unlined? Are the shoulders unpadded as well? A very nice addition Simon. Excellent for Spring/Summer it also looks as if it will match to a wide variety of trousers (and social situations). In comparing materials would Fresco (in blue) have given any advantages or is the Hopsack slightly stiffer and hence more suitable for the DB cut? You mention the jacket becoming a favourite. It would be good to get more of your thoughts on this; we all have favourites but it’s interesting to know why… (style, fit, colour etc., generally it might also be how it makes us feel; comfortable, smart, relaxed etc.) . With the many great items in your wardrobe which are your ‘go to’ items to wear and why… also which commissioned items, though fine in quality and cut, have not been worn so much. Fresco would have actually have been stiffer, but it varies between cloths. Great jacket! I am very interested in that polo shiet – will it perhaps be something that will become available as RTW? Approximately when will the polos be available you think? I am looking at the Wang ones a previous poster mentioned, but would like to compare them to your offer before splurging. Very nice! What is the weight of the cloth? You had mentioned lightweight hopsack usually not hard wearing enough for trousers. Will heavier weight hopsack durable enough for trousers ? I am thinking to order a hopsack suit, but I bit worry can it last long. Question: what are the general “properties” of hopsack? Would you characterise it as “summer cloth”? How does it compare with linen and fresco, in terms of “coolness” and pros/cons? I heard linen is the coolest but the wrinkliest, and that fresco is of the two the more ‘formal’ because it’s wrinkle-resistant. Where does hopsack fall for these criteria? Would it ever be advisable to commission a suit in hopsack for business wear, or better (always) to opt for fresco (for summer business suits)? Very nice, Simon. Proof that relaxed dress needn’t be scruffy! Great post. But I also have a question about the bits either side of the summer, spring autumn and early winter. When a coat may not be required but a shirt and sweater won’t cut it. What would say is the most versatile. I was looking at having a patch pocket flannel blazer made as I thought this could work with chinos, jeans and of course matching flannel trousers if I was to also have them made at the same time. Or should I be looking at something else?. The way I’m looking at it at the moment is I get a nice slightly informal (due to the construction) flannel suit with a jacket I can actually wear with nice chinos (RL PL and incotex) and even smart jeans. Lovely. Where were the photos taken? Lovely jacket Simon – I’ve always been slightly wary of a DB for more casual wear but this shows how it can be done. Who makes the fabric? @Jack, I was slightly confused by your comment; are you saying you wish you’d gone for a different, more casual fabric than hopsack, or that you’d gone for a more casual cut? Great cut, cloth and general look! One of my favorite projects you have presented us, so far! In your opinion would it work with gilt buttons, with same patina? It could do, yes, though obviously that makes it far less conservative. Unfortunately most mills, and particularly Loro Piana and Zegna, change their collections regularly. So there’s a good chance the precise cloth is no longer available. Its the actual fabric itself. Whilst it is hopsack it has a very smooth/ untextured finish and as a consequence a bit of a sheen to it. As a consequence it looks much more like business suiting despite the casual/ unstructured cut. This is a lovely blazer indeed! You are right about the width of the lapels. Most importantly, this type of DB can easily be dressed up or down. Light hopsack is surely a nice fabric for Summer. But I would like to know what you think of light blend fabrics also used for Summer jackets such as wool, silk and linen, and others you surely know. Are they hard wearing as pure linien or wool? what trousers ( other than cotton chinos/ trousers) would be ideal for an hopsack jacket? I was thinking about fresco trousers, but they are very hard to find rtw. I was thinking about pale grey linen trousers. Do linen trousers risk of looking like suit trousers? I prefer light gray because I already own a pair of cream cotton trousers and I want to differentiate. I commissioned a single breasted, navy hopsack jacket I would like to show you. Can I send you an email? The material is certainly ok in weight for the English spring and summer. It’s so light that the DB doesn’t make much difference in that regard. Style wise, it is always less versatile that an SB, particularly if you prefer to never wear it open. If that is a concern, I would go with an SB instead. As to other colours, a lighter grey could work quite well – otherwise it would be browns or greens, but I do feel you need some textural variation to make those work. I would have them in lightweight cashmeres therefore, as my Caraceni jacket. Not my cup of tea, nice material & a super shade of blue but not so keen on the DB style & lapels, I always feel with a DB jacket you are obliged to wear it buttoned up as it flaps about unbuttoned and looks a tad ungainly. Most attractive, Simon. Right now I live in Southern California where summer is just too blinking hot for any jacket, unless one never leaves the air conditioning. However, Portland, OR has a climate quite similar to the UK and you are convincing me that I need a hopsack jacket to wear after I move there. Nicely done. Hi 1 Old Bear, do mind me asking what you do with all your detritus – keys, pen, wallet, cell phone, etc? Perhaps your wife comes in handy!? Pants pockets for most. Shirt pocket for the pen (I refuse to buy any shirt that lacks on to hold pen and reading glasses). I wish I could give them to my wife but she passed away this last December. Evenings are the worst . . .
I’m so sorry to hear about your wife. Do forgive me. The problem for us men is that we don’t carry a handbag. Carrying everything in our trouser pockets (if no jkt) is less than ideal isn’t it? It spoils the clean lines and can potentially wear out the pockets. It’s also a nuisance, if you’re seated, to retrieve those things. I find a suitable jkt shades me from the hot sun. Still, I live in London – not Sth California! As always, an excellent article. I’m looking to have a jacket made in the Neapolitan style. My intention is to wear it with jeans and chinos. Therefore, I need a fabric that has some texture. Unfortunately, a lot of the hopsack fabrics are either too light for my taste (I’m in the North of England) or the choice of colours is rather limited. From what I’ve seen they tend to be blues and greys. Are there any other fabrics you could recommend? My ideal would be something in either green or brown. I suppose a lighter Tweed would be an option. However, I’m not too keen on Tweed as its a bit “rural” for my taste. I think a Donegal tweed is probably the only option for me. It would give me the texture and choice of colours. I’ve steered clear of cashmere as I’ve always thought of it as being not as hard wearing as other fabrics. Great cloth and colour, but I do struggle to see how a DB can be worn informally, or just ‘thrown on’, I think they’re just intrinsically formal apparel. I love your website, and your commitment to craft and quality, but find once you stray out of the formal, the styling can sometimes get a bit dubious. Smart casual is probably the most useful – and difficult – style to pull off well. More on it would be very interesting. Thanks Chris. One thing about smart casual is how broad a spectrum it is. I throw this on at work, when I am always wearing chinos, flannels or other semi-formal trousers. It works with any of those, given its colour and styling. But the Neapolitan make helps a lot. Have you worn a Neapolitan DB jacket? I think that a DB in such a wonderful cloth can never match an SB in the same cloth as a casual coat for the simple reason that you really have to wear it buttoned, whereas an SB in casual mode can comfortably be worn open or buttoned. VBC hopsack, mentioned above, is quite a lovely cloth, and it comes in a variety of colours which would all lend themselves to a coat of this type. There’s no technical reason why a DB is more formal than a SB. Is a peaked lapel physically more formal than a notched one? No. It’s just a different shape! So, the only factor is cultural habits. Tradition vs modernity. 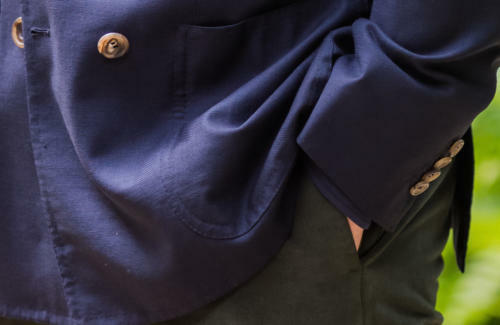 Is a patch pocket more casual than a jetted flap pocket? Yes, but God knows why. Cultural habits again? Town vs country maybe. I’m not keen on DBs with patch pkts, slant pkts or out tkt pkts. Nor SBs with peaked lapels. I’m a traditionalist! However, I like Simon’s take on a DB in the context that he’s wearing it. He’s making it informal with the pkts, buttons, construction and the other clothes that are worn with it. He’s bent the rules. Isn’t it just about the coat being buttoned or not? An unbuttoned SB looks fine, but an unbuttoned DB just doesn’t: there is too much cloth flapping about. Nick, I’d certainly never wear a DB unbuttoned myself. Too messy as you say. Some do, of course. Maybe it suits them! If you like to wear your coat open, it’s got to be an SB obviously. I don’t think Simon is saying that such a jkt has to be a DB. He’s just giving us a nice example of an outfit for a certain situation. I think! Yes, fully agree Simon, and even more louche if the jigger is attached. Dear Simon, Excuse myself for writting to you for the first time, My name is Hiro Yamaguchi based in Tokyo Japan, I love your Jacket very much, the cut works really well as it looks classic as well as modern. My recomendation is to get that type of Jacket made up with a mohair blended hop-sack summer jacketing cloth provided by William Halstead which has very crispy handle but absolutely a beautiful cloth to wear in Summer although it is only my preference!! I really enjoy your blog here in Japan. 1. When you commission a suit or a blazer (jacket) like this one, is the length an issue you care about? As to length, do you make a distinction between suits’ jackets and blazers (jackets)? 2. If you ever happened to wear this blazer with black shoes, how could look like the rest of your outfit? Obviously, I have in mind the highest scale of formality you could get with it? Length is certainly a factor. The minimum is that the jacket has to cover the seat. I would often have Blazers a tiny bit shorter than suit jackets, but it is more determined by style than anything else (Neapolitan v English). I wouldn’t ever wear this with black shoes, certainly not calf anyway. Perhaps black suede, but 99% brown in various shades to go with the trousers. Slightly off topic. I recently bought some horn buttons and noticed on several of them that they have a straight line running from the centre to the edge. Is this common on horn buttons? It seems strange that the line appears on only some of the buttons. They often do, particularly dark ones. The variation between the buttons is also natural. They are real horns after all, not blocks of plastic. Hi Simon, no I’ve never worn a Neapolitan DB, and to be honest, have never really worn a DB of any kind. I personally find them just a little too ‘full’ on the material side of things, i.e. there seems to be too much of it, and it feels more like a coat than a jacket. I do think this jacket is beautifully cut, and looks good on you, just not my own taste for casual wear – different strokes and all that. I’m Alfonso, from Salerno (Italy), 25 years old. I follow you for a long time, I have doubts about what buttons I have to get for my last blazer. It is an holland&sherry wool&mohair dark blue but not midnight. We can say I can wear it 4seasons. It has 3 patch pockets, “rullino” shoulders with few “rullino”, 3-to-2 buttons (Napoli style), peak lapels (11 cm), and 1 arm button. What button can go with it? Ancient silver ones? I can imagine only this type, can you suggest me others? I will not go for gold button. It is not my style. Interesting question. It will depend a lot on your personal taste. Metals are the first option normally – gilt, silver or brass. All can be nice, though as you point out vintage ones can be a lot nicer as they have that personal, patinated look straight away. Other options worth considering are mother of pearl (I’d go with a dark shade rather than white) or simply pale horn. The latter is less suited particularly to a blazer and therefore I’d only go with it if nothing else works for you. I’ve been admiring this jacket since you posted the images. May I ask whether it is a navy blue hopsack or another shade of blue? Seems a bit lighter than navy to me, but that might be the images or just my particular kind of screen. Hi Simon. Just wondering, is the jacket completely unstructured? No canvas or interlining of any kind? Thanks. In terms of weight, would a 320 g hopsack be less suited for summer wear, do you think, even if it is unlined (I’m thinking single breasted)? 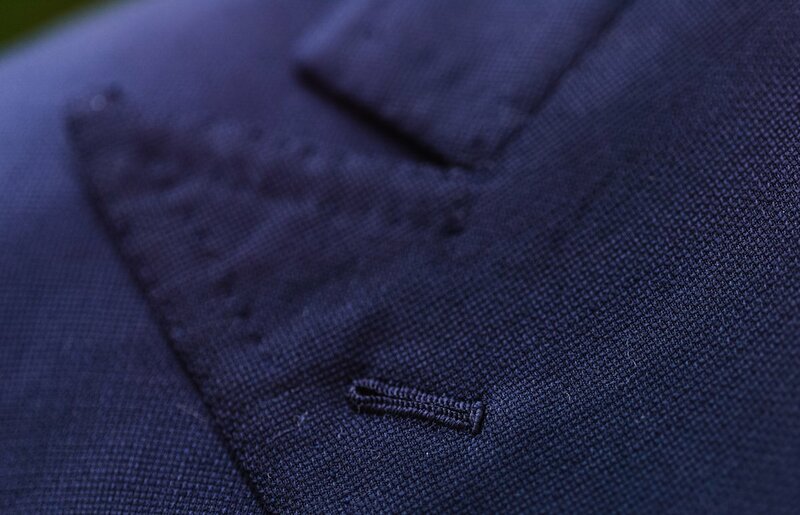 And if there is a slight sheen in the (navy) hopsack, would that make it more formal? Looking at this particular jacket of yours for several months now, it seems to be the ultimate go-to jacket! I noticed that you mostly use Solindo and Caliendo for casual jackets. What do you think about using a tailor from Naples for a business or dinner suit? Or you have used them and written about them but I missed out on the post. is a white dress shirt seen through an unlined hopsack or fresco jacket? 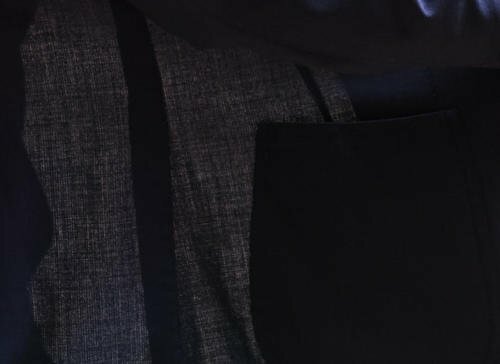 Is a dark canvas a must for a navy jacket, because a normal canvas can be seen through? Hi Simon, do you have references of this wonderful fabric? Thank you. Are you happy with the choice of structure for this jacket? I am commissiong a single breasted jacket in a similar fabric, but was thinking to have it full (light) canvassed and fully lined. Do you have any thoughts on this? Would you strongly recommend your style in stead? I am thinking to use it almost all year around at the office – this is actually my first navy sports coat, and is therefore also going to be my standard navy sports coat until I commission a navy cashmere one as well somewhere down the road. Aha, so then the see through-parts of the jacket in the one picture is the parts of the jacket without canvas. Thanks – fully canvassed and fully lined it is! Yes, obviously without lining, but there isn’t any canvass either in the see trough-parts? Or is the canvass itself also pretty translucent so that there actually is canvass? Normally (and I guess always) the canvas doesn’t cover the whole front. 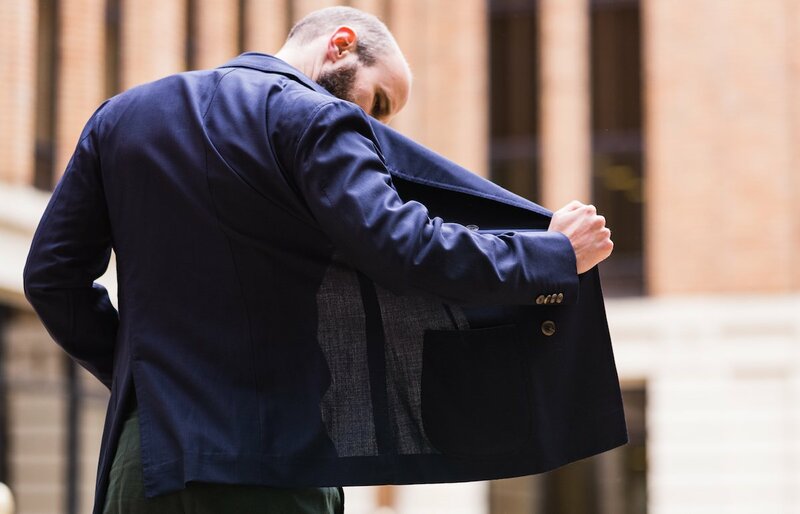 You only have canvas in the front of the jacket, narrowing down as it runs down the jacket. The dark bits you can see in the front are the canvas, covered by lining. I am planning to commission a jacket like this in navy hopsack, but probably not DB. What kind of lining would you recommend for a summer jacket in hopsack? I am thinking quarter lined but are not really sure. Quarter lined would be really nice, just make sure the hopsack isn’t too open in weave to show a lot of white shirt through it. And I generally prefer matching linings or something dark and subtle, eg dark green. Bright linings are quickly regretted. What are current prices for Elia? Is he cheaper if one visits in Naples? If so, by how much? Hi Simon, i am looking for a smart navy sport jacket or blazer that I could wear in the warmer months, spring, summer and autumn while pairing with my worsted wool suit trousers and perhaps cream chinos. What would be the most versatile fabric in your opinion that will pair well with the aforementioned trousers? Also would you suggest a sport jacket or blazer? Hi. If you want it for warmer months, I’d suggest hopsack, as shown in this post. Be careful with worsted suit trousers though – many are likely to be too smart or sleek to work as odd trousers. What kind of tie would you wear with a navy hopsack jacket? I’m guessing grenadine is not the best given similar textures. Semi formal leaning towards casual. Let’s say navy hopsack jacket made in the Neapolitan style with flat front mid grey crispaire trousers. Any suggestions? I’m not too keen on printed silk ties. This is what the levels of formality are for! Sounds like you’re aiming for around 3.4, in which case I would suggest a knitted silk, or perhaps a lightweight wool. Ha! You’ve covered the exact outfit I’ve got in mind. Thanks, I’ll book mark the page. I would like to now if worsted yarn is used for hopsack construction (and in general other open-weave constructions like fresco etc). From what I saw the hopsack-constructed blazer yarns look dry and stiff, totally the opposite of the fuzzy and warm look obtained with non-worsted yarns. However I often saw in your comments that you are making a distinction when speaking about worsted wool and hopsack. Is it a shortcut used to clearly separate the formal look obtained with worsted wool and the more casual look obtained with worsted wool in a hopsack construction, or am I mistaken in assuming that hopsack are constructed using worsted wool ? Thank you for the clarification, Simon ! At 8oz this must be the lightest cloth you have ever commissioned. Does it crease easily? Hi Simon, what is your take on “skin fusing” used occasionally in fully canvassed jackets? It seems to be quite common in lighter weight fabrics to make tailoring a bit easier. But surely there would be a risk of delamination? I’m looking for a summer weight blazer (your hopsack blazer looks good to me). 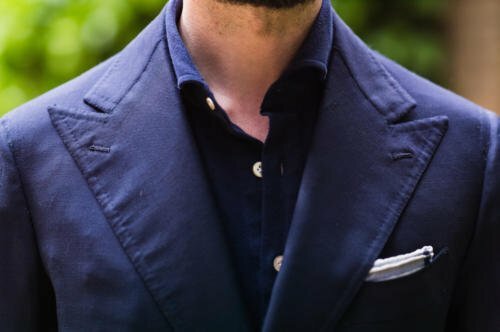 I’m looking for a fabric for a navy DB blazer that will be worn almost the whole year around (but perhaps not the warmest summer days). It will be worn quite regulary so the fabric will have to be durable (and of course prefarably ”last a lifetime”). I was thinking about a heavier hopsack, but I’m really not sure… Any suggestions? Do you think it would be a good idea to have a summer hopsack jacket completely unstructured? I know bespoke tailoring merits shaping, but just curious as to what your opinion is on unstructured sport jackets. I have just commissioned a hopsack/fresco (310g) jacket in navy blue. At this stage, as it is the first jacket I have had made from this Neapolitan tailor, I have just had measurements taken. I opted for a half lining rather than full lining. However, I now wonder whether, given the relatively short summers in the UK, whether a full lining might not be more useful and also help to preserve the shape and line of the jacket? What are your thoughts? Hi Simon – what are you thoughts on swelled edges? When are they appropriate? Does the Hopsack blazer have sleeve lining or front living? Do you have any photos of it and the finish of the edges? You mention your Solito cashmere as the autumn/winter version of this Hopsack summer blazer – nice twins there. If you were to pick only one navy/midnight blazer fabric to cover most of the year except perhaps for the hottest days of summer, could you name one? Think your Swiss army knife blazer. I thought I had found it in a Fox basket weave, but it turned out too delicate for extensive wear and is really a seasonal spring/summer cloth. Now I’m looking for another, less delicate one to go with flannels but also with cottons, and perhaps (though less) with linens. Fox have a 11/12 oz Hopsack that they also offer as a RTW blazer now, and a Fine Serge of the same weight. Both are blazer classics as I understand. I imagine you may have already seen both fabrics live. Any thoughts on those or other suggestions? Thanks a lot, Simon! I think a heavyish hopsack is probably the closest you’ll come – ideally a bit more than that 11/12 oz, but that would still be good. It would be too smart from some cottons and linens, but still very versatile. Don’t spend too much time trying to find the jacket that goes with everything – it doesn’t exist! I am an avid reader of yours. It has been extremely helpful in building up my closet as a student starting work-life. I have a question. I am about to commission a double-breasted blazer, but I am struggling with the choice of fabrics. I don’t want the solid (dark) navy my tailor offers, but rather something with a bit of texture. I am not sure what the rules for blazers are, and so I would like your suggestion to understand them, and hence know how to break them. HI Simon, Could I ask about the suit, if I tailoring a wool/mohair jacket in dark navy (with a hopsack fabric) could I go suit with the hopsack fabric? Or I couldn’t? ( it’s for a wedding and business ). Additionally, the hopsack fabric can only use for jacket? Thank you in advance! I stumbled upon a chocolate brown H&S hopsack jacket on the Anthology’s instagram. The bunch is called Crystal springs, which was just launched. The hopsacks in the bunch are a combination of silk, linen, and wool and seems to shed much of the wrinkling you see so much with linen. I would describe it as a more understated and less flashy version of the Italian wool/silk/linen blends that tend to have that distinct linen/silk fleckle and rough texture. I’ve been looking for something that can cope with 70-80 degree Fahrenheit 3 season weather in the Bay Area, California that is business appropriate and this new bunch seems to be an amazing option. Can you recommend which merchant/ mill has some plain navy hopsack in slightly heavier weights (eg. 280-350 grams)? I tried to go through the websites for fabrics but they do not specifically categorised their fabric as hopsack. Unfortunately I have checked on Fox website and it’s no longer available. Any other ones that you know of? Appreciate for your response Simon. Fox does in 11oz and 15/16oz (which I own and I can really recommend for fall winter). There is also a classic Hardy Minnis 370g perfect for 3 seasons. There is also a hopsack in Mesh Blazer bunch by Holland & Sherry (13oz). Hi Simon – great post. What do you think about this hopsack fabric by Fox? Do you think this could be a good option, unlined perhaps, for an all-season casual patch pocket jacket? Hi Simon, I love this, but I assume because the material is so lightweight and see-through that you can only really wear with a dark shirt? I ask because I would typically stick to a white or pale blue shirt but am thinking this is going to show up through the open weave? I have a question regarding this particular color you chose for the jacket. It seems on the photographs, that the navy has a tinge of purple to it, is that right? Now I have acquired my first navy jacket (it is the open weave wool jacket from Drake’s). It seems to be the best possible starting point in terms of jackets. Now that Drake’s jacket has tinge of purple to it too, and I find that makes it a little harder to pair with other colors. For example my indigo scarf does not go very well with it. Also, when it comes to pairing the jacket with green trousers, the green needs to have a certain shade in order to work well with the jacket. Even with light blue oxford shirts, there’s some light blues that don’t work. Do you experience this too with purple tinged navy jackets oder coats? And do you have any advice in therms of pairing it with other colors? To be honest, I’m not sure it does have a purple tinge – it’s a pretty straight dark-navy. I haven’t found it hard to combine with other colours as a result, though it’s definitely better with colder ones like white and grey, rather than warm browns or greens.